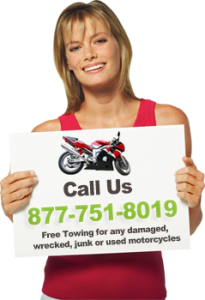 Has your motorcycle been wrecked or damaged from a crash? Whether or not you have insurance, we can buy your Motorcycle without you having to go through the hassle of getting it fixed and waiting for the body shop to have it ready for you. And, if you do have insurance, you can keep your check from them and then get a check from us! We buy all motorcycles with mechanical problems, even if your vehicle does not run. It is quick and easy to get cash for Motorcycles with our free online form anywhere in the United States. TheBikeBuyers.com purchases all bikes of all makes and models at all levels of damage. We offer cash payment for your vehicle in “as is” condition. We will buy your bike and you don’t have to spend a penny. Whether your bike is running or not, whether it has major problems or just needs a lot of little repairs you can sell your Motorcycle to TheBikebuyers.com. No repair bills, no guesswork. It is quick and easy.